The theory that chefs should sleep under the stove and never leave the kitchen has always seemed a rather limiting one to me. Get out and eat, I say. Always on the lookout, I encountered Eben, a South African writer cooking in Melbourne, and considered his food instantly rich with potential. Here is my interpretation of what we ate the night I met him. Serve with mash, cabbage and some quince cheese, which goes very well with the dish. Make 5 incisions into the lamb shanks. Press a raisin and a slice of garlic into each cut. 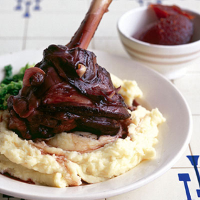 Put the lamb shanks and all the other ingredients, except the port, in a plastic or china container (do not add salt at this stage). Marinate in the fridge for at least 2 (or up to 3) days, turning every half day or so. Heat the oven to 150°C/gas 3. Put the shanks and marinade in a heavy, non-reactive pan with a well-fitting lid, adding a good pinch of salt. Cover and put in the oven for about 3 hours, turning the shanks every 30 minutes. If they are cooking too fast, turn the oven temperature down: the secret is slow and low with this dish. The shanks should be thoroughly giving but still just holding on to the bone; when this is achieved, remove the shanks and keep warm. Add the glass of port to the juice in the pan and put over a high heat, reducing the sauce briskly for 5–10 minutes, until slightly thickened. Sieve the sauce over the shanks and serve. There's port, a bottle of red wine and some red-wine vinegar in the dish already, so the best partner needs to strike a mellow note. Classic rioja does just that – and it's great with lamb, too.